When Red Velvets are involved, everything is Great! When Chocolate accompanies the reds, it can"t get better!!!! It's Enticing, Smooth, Creamy, and Decadent....it's Delicious! This chocolate mine bundt and red velvet whoopie pie gift basket features 2 Red Velvet Mini Bundts with buttercream whipped on top, 2 double Chocolate Mini Bundts, 3 Red Velvet Whoopie Pies, and 3 Chocolate Whoopie Pies, individually packaged. Arrives in Our Signature Gift Box Wrapped with Care and ready for presentation with a personal gift message of your choice. Widen your loved ones smile with the most Beautiful Gift. It's Beautiful, it's Dulcet. 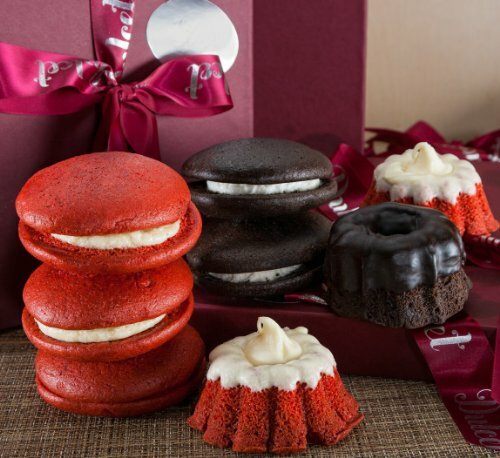 Gift Includes 3 Red Velvet Whoopie Pies,3 Chocolate Whoopie Pies, 2 Red Velvet Mini Bundts and 1 Chocolate Mini Bundt. Arrives in a Designers Maroon Keepsake Box with a Coordinating Ribbon. The Gift you want, The Taste you Deserve! Kosher-Dairy - All natural - No preservatives. The Original Cakebites, Ultimate Party Cake! (12)- 2oz Packages.